What they are: Track and sew extensions are the most popular method. They are one long piece of weft applied to your hair on tracks. A tiny cornrow is braided from each side of your head and then held together either with an elastic band or stitch. The weft is then sewn onto the cornrow to make a track. Most cases 3 tracks is enough, but bigger heads or thicker hair may need 4.
Who they are for: Track and sew extensions are for beginners mostly or low maintenance women. If your are use to clip ins but are sick of teasing your hair and redoing them everyday, then track and sew extensions are the best method to switch to. If you are a woman who likes to change up your style or color quite often the track and sew are the most cost effective method to do so. If this is your first time getting extensions done then track and sew are the best first step! Type of hair needed: Track and sew are done with a long weft of hair, which is pretty much the most common hair that is sold. It is sold in one long strip, only one brand is sold in bunches. Just make sure the top is stitched across. You can get it machine weft or hand tied. Hand tied sheds less than machine weft and therefore lasts longer but of course is more pricey. Kind of hair: The best hair is called Remy hair. Remy is not a brand itself, it is just a type of hair. Remy means the cuticles are pointed in the same direction. This is the healthiest hair, it lasts longer, and reduces tangles. So you can choose any type of brand you want but you want to make sure it is "100% human remy hair". Remy hair is not cheap. Color: To match the color of extensions to your hair color you must go to the shop and have them hold it up to your hair out of the bag. Make sure the ends match not the roots because the ends are what blend into the extensions. 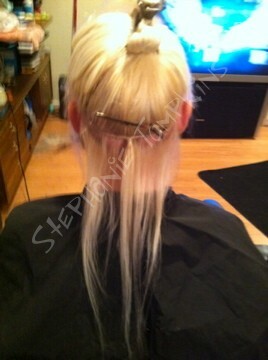 I am able to color match extensions you choose but there is no guarantee it will come out a perfect match. Color extensions and hair extensions are two different color lines. I can not dye your hair a #2 and then send you to buy a #2 extension... they will not match. Installation: Installation time takes about 45min to 1 hour. Installation includes 3 tracks which is equivalent to 1 pack of hair with every track doubled. Installation also includes a flatiron and any cutting/blending needed for a natural look. Every installation gets a take home care sheet as well if needed. Cost: $120 for installation. $10 per track for tightening. $10 per track for removal. Cost of hair varies. The cost depends on the length you want and the quality you want. Low end can be as low as $90 for 12 inches and high end can be as high as $300 for 20 inches. It is a huge range but it is your choice. If you want to keep it in for 3 or more months splurge on the higher end hair. If you are going to change it up next month or you know you don't take very care of your hair there is no need to waste your money on high end hair, average $100 is still good hair. Risks: These extensions do not damage your hair. Damage occurs from poor maintenance, styling tools, and excess pulling of the hair. Consistent scratching can create bumps/pimples and/or sores/scabs. The weight of the hair can sometimes create stress where the tracks begin especially for finer hair. It is suggested to get your tracks redone more often in this case, I always move them to a new position when I redo them. I will not quadruple tracks as the weight is also too much for the tiny tracks I do and may cause temporary baldness. You must brush your hair at the scalp. If matting occurs here the extensions should be replaced asap. Length they last: On average these extensions last 1-2 months. Tightening is needed in 3-4 weeks. And as long as you keep taking care of the hair tightening can be done every 4 weeks. The general rule is if you have 1 finger width of regrowth its time for a tightening! Keep in mind when tightening it is just resewn a different way, it will never be as tight as when it was first installed. Also when tightening is done the track becomes slightly thicker than what it originally was. If either of these bother you, have a new installation done. How long they last also depends on how fast your hair grows and how well you take care of them. Maintenance: Use your leave in conditioner and serum everyday! Serum will help reduce tangles dont be shy. Leave in conditioner helps with brushing so you are not snapping hairs that will eventually matt up. You must brush the hair at your scalp, sections are always a good thing. A boar-bristle brush or a loop brush is suggested. I do sell loop brushes. You need to wrap your hair every night to make it last. Braiding it is also ok, but wrapping is better. Removal: Upon removal the thread is cut and the braid is brushed out. Do not get your friend to do this after they have been in a long time! Sometimes matting hides the thread and they end up cutting your hair instead. Come see me. I am patient. Removal is half price if a new install is done the same day. Remember that everyday we shed naturally 50-100 hairs. When you have a track the hair has no where to go it is caught in the braid. When your extensions are taken out you will lose hair. This is only your natural shed that has already fallen off. There will be a lot as track and sew extensions are the worse for build up of shedding especially over long lengths of time. But it is completely normal. Why you should get them: Because they are the most popular method. They are undetectable if blended properly. They are easy on the pockets. They can add highlights or lowlights instantly. They add beautiful lengths and volume. They are the more temporary method of all the extensions so change is easy. They are the best first step if you have never had extensions before.